The Sitka sac roe herring fishery stood down on Tuesday (03-27-18), as the Alaska Department of Fish & Game carried out aerial surveys of Sitka Sound. According to a press release issued at 3:30 pm., weather during the flight was poor with 20 knot winds and snow squalls. No herring were spotted from the air. So far, ADF&G has permitted the fleet to fish twice this week in northern Sitka Sound. The fleet landed approximately 2,400 tons during a five hour opening on Sunday (03-25-18) and 400 tons during a four-and-a-half hour opening on Monday (03-26-18). Over 8,300 tons remain for this year’s 11,128 ton harvest quota, all of which is being taken through a “non-competitive” cooperative fishery. A cooperative fishery means that 48 permit holders will divide the catch equally. There are approximately 30 boat participating in Sitka and seven processors involved. The Alaska Department of Fish and Game measured 7.0 nautical miles of active spawn on Kruzof Island on Sunday, March 25th. Prices in Japan have been in low in recent years, so the fleet agreed to a coop this year to save money and target the highest quality fish. 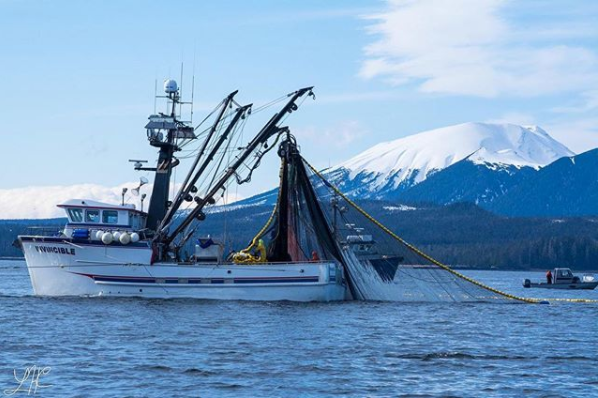 The fishery happens on the heels of the Alaska Board of Fish meeting in January, which closed off more water to commercial fishing after nearly 100 locals called for more subsistence protections during public testimony. Dan Castle, President of the Sitka Herring Marketing Association, said permit holders are worried about the fishery and proud of it too. “We want to feel welcomed back in the community. We want it to be a world class, fantastic fishery that everyone can take part in. We think we can do it and satisfy everyone’s subsistence needs. We don’t think they’re mutually exclusive,” Castle said. With a cooperative fishery at hand, ADF&G tends to open a larger area. 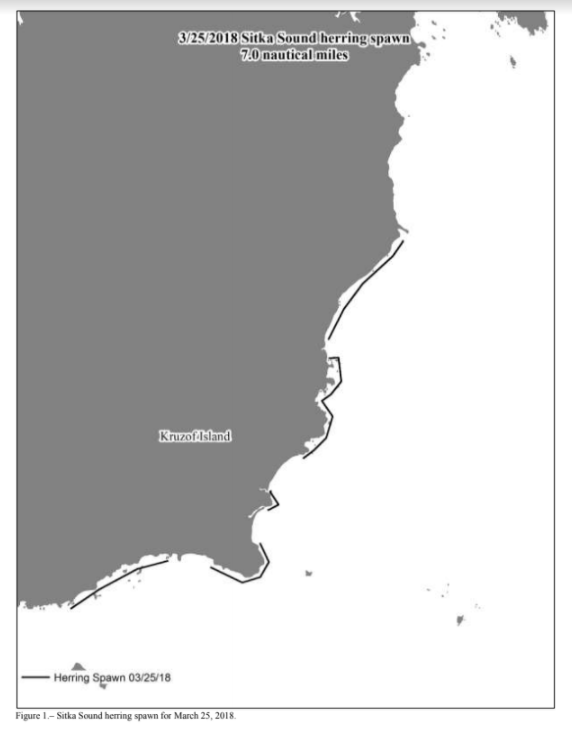 Monday’s opener stretched between Katlian Bay and Nakwasina Sound on the western shore of Baranof Island and from Inner Point to Mud Bay on the eastern shore of Kruzof Island. Herring return to Sitka every spring to spawn. So far, ADF&G has measured 7.4 nautical miles of cumulative spawn. Much of that was seen on the eastern shore of Kruzof Island. A survey conducted by the Kestrel, the state’s research vessel, on Monday saw schools of herring in the deeper waters east of Middle and Big Gavanski Islands. Several schools were also located south of Sitka, but no large biomass was found.